Judith Rutschman interviewed me on a segment of her TV program, Nature of Conservation. The recent interview was my second filming of the program. Our first interview in 2008 discussed Peace Bee Farm’s activities, mostly producing honey and beeswax products. At that time, a mysterious condition in which the adult worker bees disappeared from their hives was in its second year. We discussed the researchers’ efforts being undertaken to identify the causes of the resulting massive honey bee die-off, called Colony Collapse Disorder, or CCD. With the passing of seven years, Judith and I revisited Peace Bee Farm’s operations and the condition of honey bees across America and around the world. The continuing die-off of bees brought about ample media coverage, resulting in considerable public interest. Media attention helped bring about a number of university studies seeking the cause of CCD. Peace Bee Farm participated in several of these studies. Many concerned individuals responded by purchasing bees and hives. 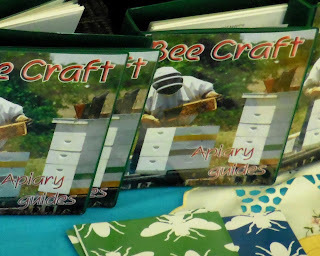 These new beekeepers eagerly sought beekeeping training and guidance. My role shifted over the next years to more involvement in beekeeping training and mentoring. After a few years of training beekeepers in the Mid-South, I was given the opportunity to travel to Africa to train beekeepers in Ethiopia. In some of my African assignments, I taught experienced beekeepers how to transition from traditional hives placed high in tree tops to modern bee hives. Sometimes I trained seasoned African beekeepers in new skills to share with others when they returned to their local villages. At other times I gave farmers their first lessons in beekeeping. These men and women built Kenyan Top Bar Hives at no cost using materials that they gathered locally: wood scraps, sticks, mud, and cow dung. It was always heartwarming to know that the products of the bee hives, honey and beeswax, helped increase the farmers’ incomes and ultimate survivability. Today’s photo: Judith Rutschman and Richard Underhill. See Nature of Conservation on WYPL, Memphis Channel 24, in December. 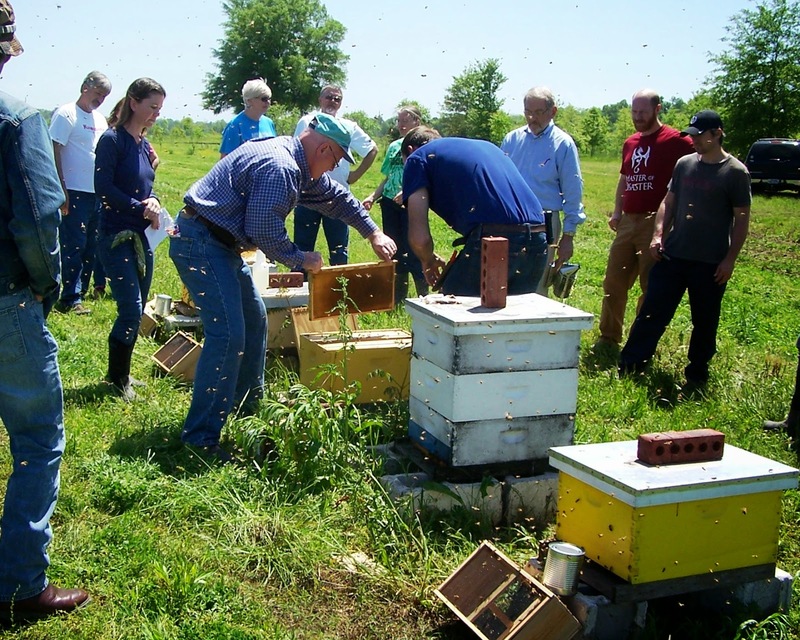 The Arkansas Beekeepers Association hosted Dr. Tom Seeley of Cornell University at its fall conference in Mountain View, Arkansas. Dr. Seeley shared his research findings based upon years of observation and carefully designed experiments that revealed much about the behavior of honey bee colonies. Much of Dr. Seeley’s research was conducted in Cornell’s Ithaca, New York Arnot Forest, a 4500 acre old-growth forest with ample mature, storm-damaged trees providing natural nesting cavities for feral honey bees. Dr. Seeley employed a technique used by honey hunters of earlier times to locate bee trees holding active honey bee colonies: bee-lining. Dr. Seeley brought a bee-lining box, the small wooden, two-compartment box shown in today’s photo. 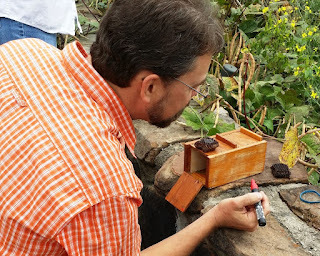 Between speaking presentations, Dr. Seeley and other interested beekeepers used the bee-lining box to capture foraging worker bees at the Ozark Folk Center’s native plant pollinator garden. At the box, foraging worker bees were fed honey or sugar syrup placed on a small piece of honeycomb. When a bee’s honey crop was full, she was released from the box to fly. The beekeepers watched the bee circle, orienting on the sun, and then fly away in a “bee line” to its hive, likely a hollow tree. Watching the bee silhouetted against the sky provided an accurate direction to the bee tree. 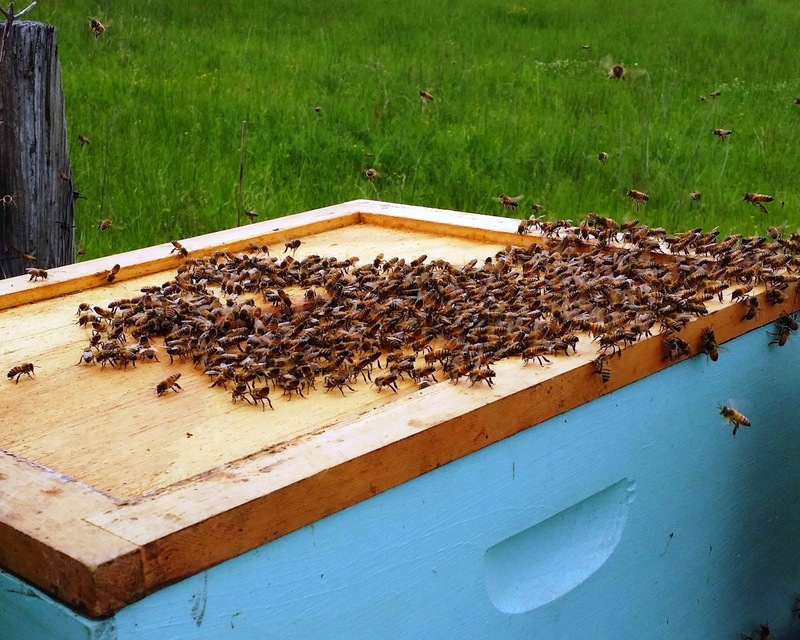 University of Arkansas Extension Apiary Specialist Jon Zawislak painted a red dot on the thorax of a forager as she engorged on honey at the bee-line box. She flew away, and then she returned eight minutes later. Timing the bee’s two-way flight plus the time involved in her dancing and passing off her gathered honey provides an insight into the distance to the bee tree. Employing bee-lining, Dr. Seeley determined that honey bees choose natural hives that are at least 10 feet above the ground, highly visible, well shaded, and with an entrance facing south. Dr. Seeley, by the way, has a bee species named after him: Neocorynurella seeleyi. How cool is that! Speaking at the Arkansas Beekeepers Association’s fall conference in Mountain View, Arkansas, Dr. Tom Seeley, author of Honeybee Democracy, described his genetics study of feral honeybees collected at Cornell University’s Arnot Forest in 1977 and 2010, http://www.nature.com/ncomms/2015/150806/ncomms8991/full/ncomms8991.html. The study analyzed honey bees before and after the arrival of parasitic Varroa mites. Surprisingly, colony densities in the forest remained the same after the introduction of the mites. Bees collected in 2010 were, however, the offspring of only a few surviving colonies that repopulated the forest. Finding feral survivor colonies is encouraging news for beekeepers. Other work by Dr. Seeley defined the mechanisms honeybees employ in swarming. 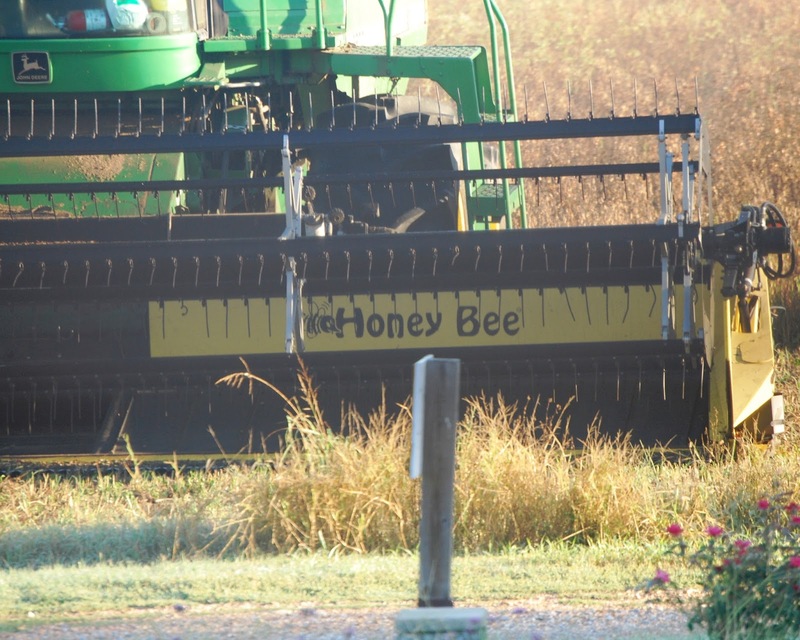 To determine honey bees’ preferences for choosing a nesting site Dr. Seeley used numerous swarm catcher hives. He questioned: How large a cavity? How large an entrance hole? Hive in the sun or shade? Direction hive should face? Can the hive be drafty? Can the hive be damp? Answering these questions help us design effective swarm catcher hives. Bees choose hives according to their ability to correct hive deficiencies. For example, if a hive is drafty, bees will often accept it because they can easily fill drafty cracks with propolis. On the other hand, bees will often reject a hive in the full sun because it is more difficult to cool in the summer. Pixar Studios filmed honey bee swarms moving from their swarm resting site to their permanent hive. Observing individual bees in flight lead to an understanding of how workers guide the swarm. Of great interest was Dr. Seeley’s finding of feral honey bee colonies surviving in the forest while carrying parasitic Varroa mites. Two significant factors seem to support the feral colonies’ survival. First, there is little drifting of forest bees. Next, honey bees in nature prefer a nest cavity of approximately 40 liters, close to that of a single Langstroth hive body. Small cavity hives develop brood nest congestion, leading to swarming. Swarming interrupts Varroa mite reproduction. 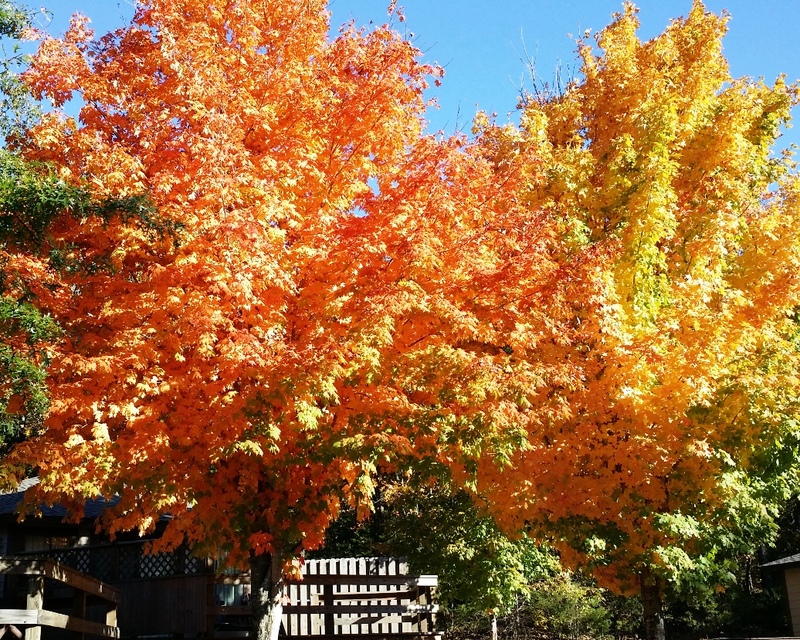 Today’s photo: Ozark Mountain maples. I spent a few most interesting fall days at Savannah, Tennessee with friends who, like me, devote much time studying history and honey bees. We combined our interests while visiting historic areas in the Tennessee River Valley. 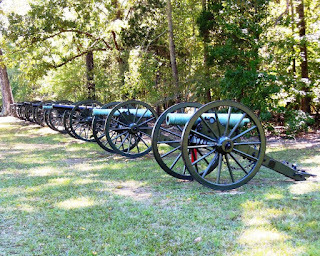 Jerry Hayes, Shirley Murphy, and I walked the fields and woods of Shiloh National Military Park, http://www.nps.gov/shil/learn/historyculture/shiloh-history.htm, the site of the horrific 1862 Civil War battle. Here, on the battlefield grounds we retraced the steps of ancestors who fought on both sides of the conflict. Shown in today’s photo are some of the 62 Confederate artillery pieces concentrated in Duncan Field, bearing down on the Sunken Road and Hornet’s Nest. We also visited other historic sites in the surrounding area, including the city of Savannah, where General U. S. Grant maintained his headquarters at the Cherry Mansion. Close by on Savannah’s Main Street the Tennessee River Museum, http://www.tennesseerivermuseum.org/exhibits.html, offers detailed views of the area’s Native American Mississipian culture, the U. S. Army’s forced removal of the Cherokee Nation in a march through Savannah known as the Trail of Tears. The museum also depicts pioneer life in the Tennessee River Valley. Jerry and I visited Shirley’s well-tended bee hives before Jerry’s presentation at a meeting of the Savannah Area Beekeepers Association. Jerry, who has made a career of honey bee health issues, discussed current research into controlling Varroa mites and the viruses that they vector. He explained that some basic research that Monsanto is conducting with RNA interference technology, RNAi, offers promise. Jerry writes the popular “Classroom” section of the American Bee Journal. He conducted a live version of The Classroom for the Arkansas Beekeepers Association. Shirley is the charter president of the Savannah Area Beekeepers Association, an active group of Tennessee River Valley beekeepers. 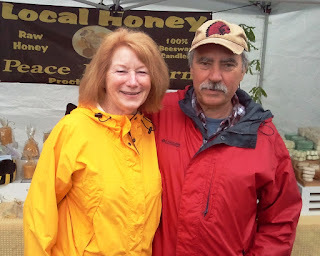 Shirley and I worked together, sharing our best honey bee genetic stock to breed locally adapted queens. Honey bee health improvement involves the efforts of devoted beekeepers in bee yards and researchers in labs. History surrounds us. Beekeepers Jim Metrailer, Jeremy Bemis, and I removed a colony of honey bees from the wall of a building and transferred the combs and bees into a Kenyan Top Bar Hive. Bees often find the empty space between the inner and outer walls of buildings as suitable cavities for nesting. Indeed, wall spaces are quite similar to cavities in hollow trees, the natural home of honey bees. We exposed the combs of the colony’s nest by removing the building’s weather boards as shown in today’s photo. The entrance into the bees’ hive, a small opening between the removed boards and the remaining boards on the right, was coated with propolis. This sticky substance, with antibacterial and antifungal properties, helps protect the hive from harmful pathogens. One can often identify a bee tree, a damaged tree with a hollow cavity housing a feral honey bee colony, by a dark, shiny propolis stain surrounding a knot hole where the bees enter the tree. The same shiny stain can also be found where bees enter the walls of a building. Honey bees varnish their hive with propolis, a substance that they gather from the gums and saps of trees. The layer of propolis is particularly evident on the rough-hewn weather boards. When we build bee hives, rough interior surfaces encourage the bees to build-up propolis on the wood to protect the hive. The somewhat pungent odor of propolis surely adds to each hive’s distinct odor. When we cut the combs out of the wall of the building, we sorted the combs according to their use by the bees. Some held brood; some pollen and bee bread; some held stores of honey. 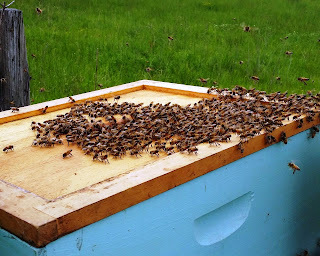 Using strings, we tied the combs onto hive top bars and placed them in the new hive. The Top Bar Hives was arranged as a natural bee hive with the brood near the entrance surrounded by pollen and bee bread. Combs of stored honey were placed in the rear of the hive. Harvesting honey has always been known as “robbing.” Bees make honey and people take it from them. Honey bees are unique creatures. They are the only insects in the temperate zone that stay alive and active throughout the year. They do this by making and storing a high-energy food for the winter: honey. The industrious honey bee makes honey from the nectar of flowering plants through the spring, summer, and fall. They continue to collect nectar as long as flowers are blooming. Then, during the dead of winter, bees cluster inside their hive and eat their stored honey for nutrition and to generate heat. A healthy bee hive produces about 500 pounds of honey per year, and it eats at least 90 percent of that honey. Prudent beekeepers can rob the excess 10 percent. However, if they get too greedy, the colony will die from starvation. Beekeepers share the experience of those who have kept bees in the past to learn how much honey they can safely rob. The honey harvest is a rewarding time for the beekeeper. Harvesting a surplus of honey means that the beekeeper has been successful in managing a large colony for the year. Some individuals have been tempted by the promise of a bee hive that automatically serves honey without the work of beekeeping. However, much of the joy of beekeeping results from actually opening the hive and interacting with the bees on their terms. Further, a bee hive with an automatic honey harvesting feature would likely rob too much of the colony’s necessary winter food, leading to colony starvation. In today’s photo, taken in Larry Kichler’s honey house, a freshly harvested frame of honey sits in the mechanical uncapper that will make a series of thin slices through the beeswax cappings to expose the honey for extraction. Larry expresses the joy of managing hives, handling bees, and harvesting honey. He has 50 years of experience keeping bees and producing honey in Kansas and Arkansas. When honey bees swarm, it is truly a fascinating and memorable event. Thousands of bees suddenly exit their hive and fly, circling in what appears to be complete disorder. After a few minutes, the bees converge in a loose ball of bees hanging from a nearby structure, often a tree limb. Honey bees festoon, or “hold hands,” with each other in the swarm; each bee’s six limbs is equipped with two hooks, well suited to grasp a tree limb or another bee’s hooks. The swarm remains in this unsupported state for a few hours or, sometimes, for a few days while scout worker bees search for a suitable cavity to serve as a permanent home for bees. Once a desirable cavity is found, the bees fly in mass to their new nest. I had the pleasure of assisting Jeremy and Emily Bemis set-up a scene involving swarming honey bees for filming on a movie set. Jeremy and I opened a strong hive, and Emily spotted the queen. We placed the queen inside a small queen cage and carried it along with the hive and bees to the movie set, leaving behind one hive body to accept returning foragers. We wired the caged queen onto a cedar tree limb selected for the appropriate camera shot. Next, we shook and brushed all of the bees onto the queen cage. 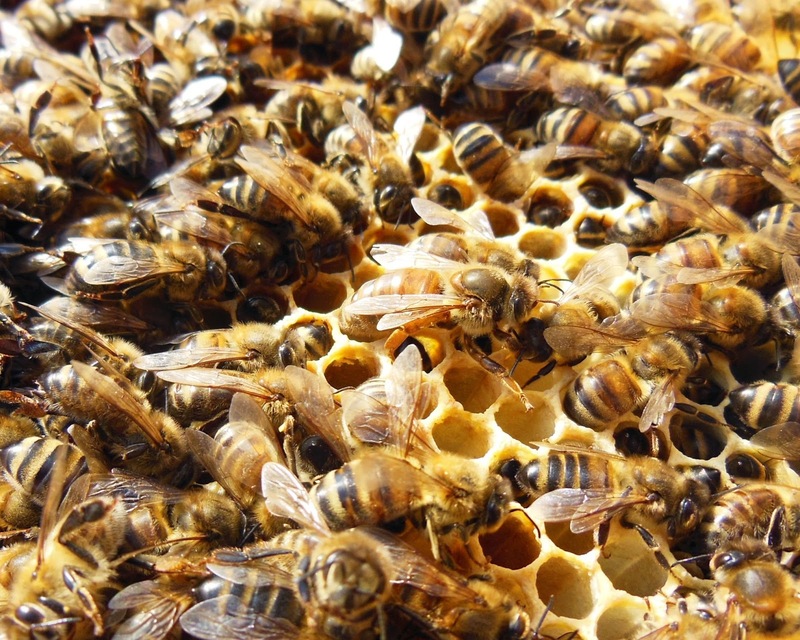 Natural swarms are held together by the pheromones of the queen and some of the workers. Soon, the bees festooned into a typical swarm shape around the caged queen. To keep the bees hydrated and lessen their flying, we periodically sprayed the man-made swarm with sugar water syrup. 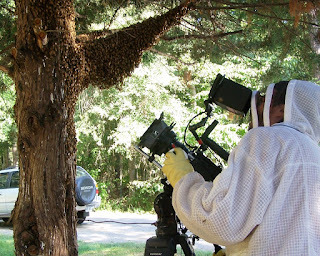 The bees performed their part in the movie as directed. Afterward, we returned the bees to their hive by placing the caged queen inside the hive and brushing in a large number of workers as well. Workers fanned their Nasanov gland pheromones to call the remaining bees. The photogenic bees returned home after dark. Mark Bittman appears in a four-minute video segment titled “What’s the Buzz About Wild Bees?” with University of California, Berkley conservation biologist Claire Kremen, http://www.nytimes.com/video/opinion/100000003822292/whats-the-buzz-about-wild-bees.html?i. The author and professor discuss honey bees and native bees and other pollinators. They also talk about the state of modern agriculture as they visit Full Belly Farm in Gwenda, California, a model for sustainable agriculture, where crops are grown to attract and support pollinators. Bittman explains, “Without bees our grocery stores, farmers’ markets, and dinner tables would be pretty barren.” Kremen defines pollinators as any animals that visit a flower and transfer the pollen from the male parts to the female parts of the flower or from flower to flower. Fertilization allows plants to produce seeds and fruit. Kremen states that California imports 1.5 million colonies of honey bees to pollinate the state’s biggest export, almonds. She mentions that California farmers import honey bees when while there are 100 to 150 species of native bees that also pollinate crops. Bittman says that just as we have become dependent upon monoculture crops we have become dependent upon a “monopollinator,” the honey bee. Colony Collapse Disorder has adversely affected honey bees in agricultural areas where bees are exposed to pesticides in crop fields. Bees imported for pollination service live on a restricted diet. Full Belly Farm is designed to supply plants to provide blooms for bees throughout the growing season. Claire Kremen, a McArthur Fellow, https://www.macfound.org/fellows/830/, received the prestigious award in 2007 when she was recognized for her studies of the behavior of bees and other natural pollinators and their critical role in the global human food supply. Kremen’s studies reveal that the ability of native bees to adequately pollinate farm crops is dependent upon their access to natural habitats. She points out the importance of restoring and protecting natural habitats on farms, a departure from the monocultural agriculture found on many large farms. 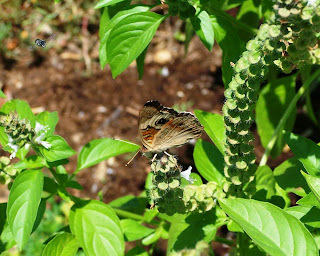 Today’s photo: butterflies and sweat bees forage basil in my garden. Honey bees don’t care what their hive looks like. They don’t mind what color it is painted or whether it is painted at all. Their only concern is that the hive is of sufficient size, dry, and ventilated. 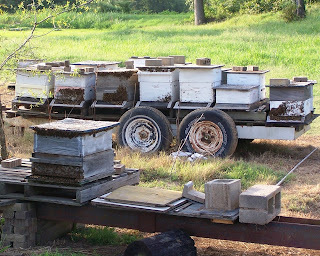 I helped a beekeeper assess the bee hives shown in today’s photo. The owner of the hives, wanting to make a sale, said that the hives held plenty of bees. At a distance, it appeared that indeed was the case. With afternoon temperatures around 100 degrees, bees covered the face of many of the 31 hives we inspected. This is quite normal behavior; when it’s hot, bees regulate the hive temperature by extending the distance between bees, moving bees outside the hive, bringing in water for evaporative cooling while fanning a breeze through the hive with their wings. These hives, however, were choked by honey stored in all available cells, poor ventilation, and too little capacity. Bee hives need the equivalent of two deep brood boxes, or three medium boxes, for adequate brood nest expansion and food stores for the brood. These hives had less volume and no honey supers to accommodate the ample nectar available. It appeared that all of the colonies had swarmed, leaving behind a small remnant of the original bee population. Strong, healthy honey bee colonies in full-size managed bee hives often contain 60,000 or more bees during the summer. Most of these hives held many fewer bees. Many of the hives’ brood nest boxes contained only three frames with bees and seven new frames of undrawn comb. Were these empty frames recent replacements for diseased frames? The available drawn comb frames were completely honey bound with no place for the queens to lay eggs. 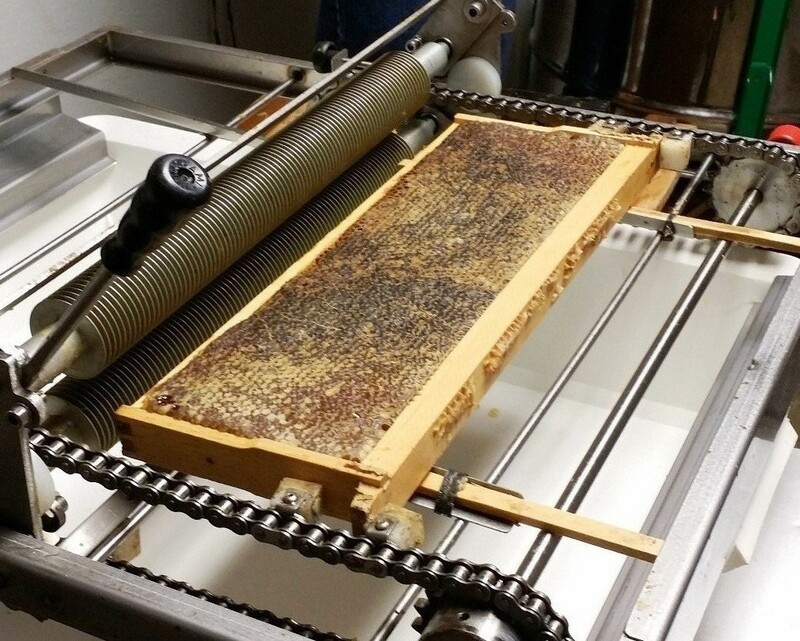 While the worn, ill-fitting hive equipment could easily be replaced, the condition of the hives made one question if the colonies carried American foulbrood, a highly contagious, spore-forming bacterial infection. Questionable hives pose too great a risk to bring into a healthy bee yard. Honey bees and native pollinators thrive in weedy areas around farms, fields, and areas surrounding urban and suburban homes. These natural areas that provide food and habitat have been greatly reduced by agricultural and lawn-care practices that control weeds with tilling, mowing, and the use of herbicides. This loss of habitat can be quickly relieved by planting pollinator gardens, simple plots managed without chemical pesticides. Pollinator gardens may be small window boxes, patio container gardens, flower, herb, or vegetable gardens, or landscape plantings around homes or businesses. Larger plots of one quarter acre or more, such as unmowed and unsprayed expressway interchanges, make pollinator pastures. These gardens and pastures will be connected along interstate highway, pipeline, and transmission line rights of way. One such corridor is planned along Interstate 35 from Texas to Minnesota will provide a 200-mile-wide path for the migration of monarch butterflies from Mexico to the Upper Mid-West, http://www.startribune.com/calling-all-milkweed-federal-pollinator-plan-needs-a-billion-plants-for-monarchs/306383591/. This ambitious plan will require the planting of millions of milkweed plants, the only food eaten by monarch larvae. While the I-35 corridor is being built to aid the monarch butterfly, many species of pollinators—bees, butterflies, moths, and bats—will benefit. 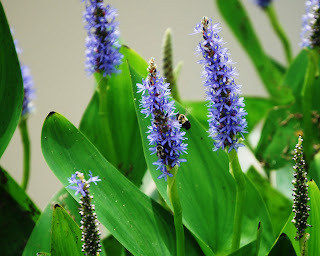 I conducted workshop sessions with Larry Kichler, a beekeeper with 50 years of experience, at P. Allen Smith’s Moss Mountain Farm, http://www.pallensmith.com/. We talked about honey bees and pollinator gardens. 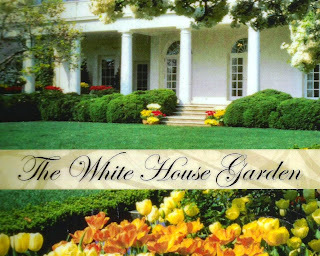 I encouraged everyone to register their gardens in the Million Pollinator Garden Challenge, http://millionpollinatorgardens.org/. We encouraged the beekeepers and gardeners to build pollination gardens in sunny locations with wind breaks, provide sources of nectar and pollen, provide a source of water, use large plantings of native and non-native plants, include larval host plants like milkweed, provide continuous bloom throughout the growing season, and eliminate or minimize the use of pesticides. 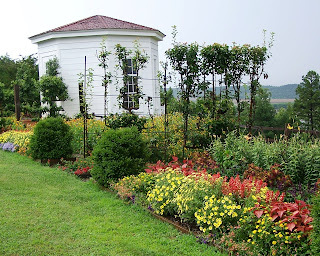 While many pollinator gardens are simple, random plantings of herbs, vegetables, and flowers, like my garden; others are more formal, like Smith’s Moss Mountain Farm plantings overlooking the Arkansas River Valley shown in today’s photo. 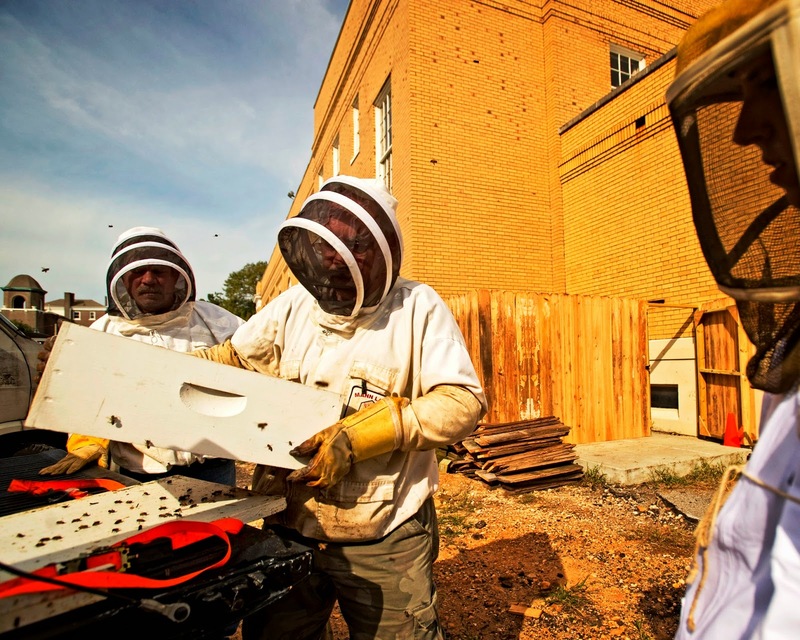 Beekeepers are increasingly placing hives within urban areas. While honey bees make good city dwellers, beekeepers planning on keeping urban bees should consider several important issues. The first consideration is the safety of people and animals in the vicinity. While honey bees are usually gentle insects, they will defend their hive by stinging. Young children, elderly people, and confined pets are particularly vulnerable in the case of a stinging event. Bee hives should not be placed near a property line or an area where people walk or frequent. The next important consideration for locating bee hives is ease of access. Bee hive equipment and honey are heavy; try to minimize carrying distances. A group of dedicated individuals wanted to place bee hives on the roof of the urban church in today’s picture. I suggested that they consider the difficulty in carrying live bees, equipment, and bee feed through the church as well as returning with dripping supers of harvested honey. They chose to build a fenced enclosure next to the building to safely house the bee hives. A fence or hedge bee hive’s entrance forces the bees to fly up above the heads of people. While bee hives are placed on rooftops in many cities, these locations are often extremely hot and lacking in shade. Honey bees consume lots of water and need to have water available at all times. Some in the public are fearful of stinging insects; urban beekeepers usually conceal their hives from view. 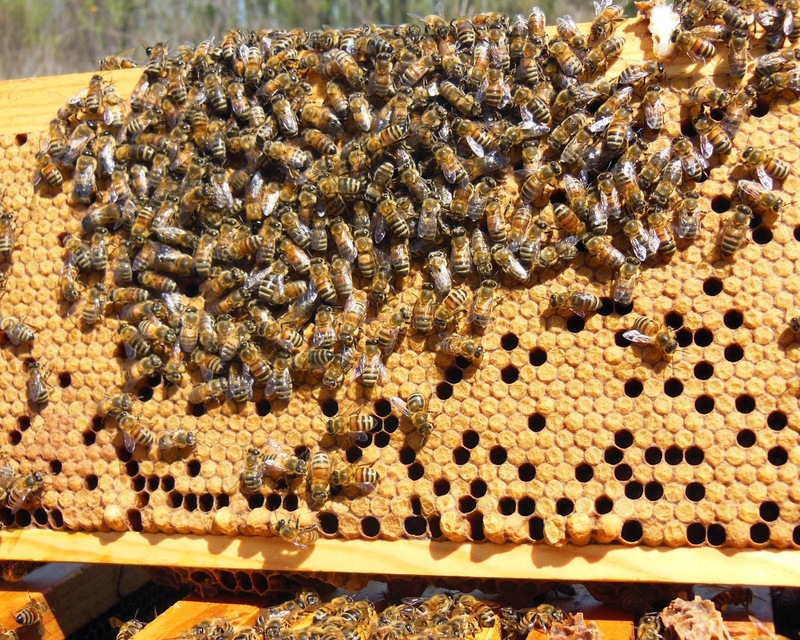 Some municipalities place constraints on urban hive numbers. However, most communities realize the benefit of having trained beekeepers and managed bee hives. They serve as advocates for the role of pollinators and beneficial insects. Understanding the interconnectedness of pollinators and our food crops, informed citizens reduce their use of chemicals in the environment. Knowledgeable beekeepers are capable of handling Africanized honey bees, and maintaining a healthy population of managed honey bees prevents creating environmental niches for undesirable insects, like hornets and yellow jackets. A promising study conducted in Arkansas found low levels of neonicotinoids in the reproductive parts of soybean and cotton plants—good news, since this is where honey bees gather nectar. Following the Arkansas study, Little Rock television reporter, Sarah Fortner, interviewed Jon Zawislak and me. View the “Science with Sarah” episode at http://www.thv11.com/videos/news/local/2015/02/06/23011219/. That’s Sarah and me examining a honey bee hive. Honey bees in the temperate region spend the majority of the winter inside the hive, clustered together for warmth. The colder the temperature, the tighter the bees cluster together. On warmer days, the bees expand their cluster and move around inside the hive. On these warm days, the bees uncap cells of stored honey and share the honey among the clustered colony. When the hive cools at night, the bees constrict to a tight cluster, pulling away from the available stored honey. 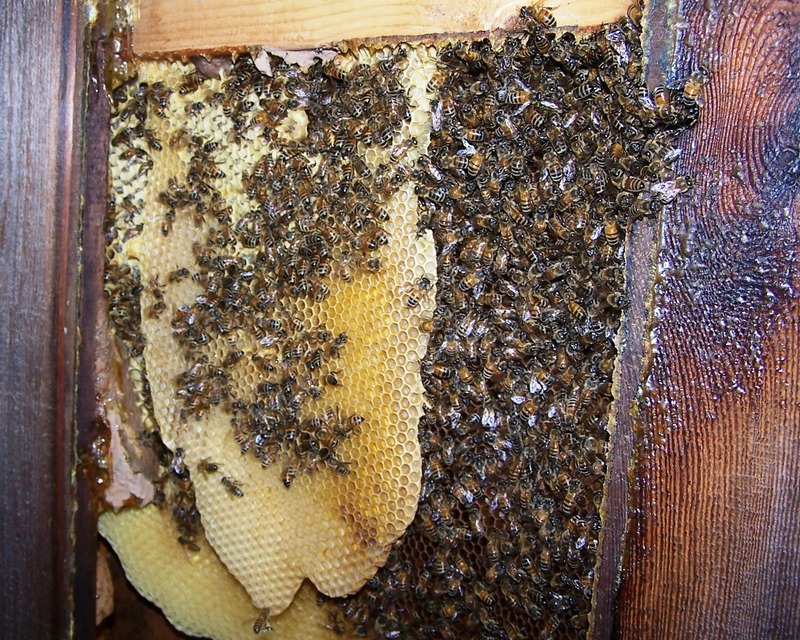 The cluster always covers hive frames that contain brood, warming and protecting the fragile developing bees. If the temperature remains cold for an extended period of time, the tightly clustered bees are left at a distance from their stored honey. This can easily lead to starvation; the bees run out of food while there may be ample food merely inches away. It is common in the Mid-South to have a brief period of warm weather in the middle of the winter. During this “January thaw,” the bees are able to fly from the hive to make cleansing flights in which they defecate. Bees eliminate their body waste in flights outside the hive. This winter has seen somewhat erratic weather. This warm weather has given beekeepers an opportunity to make brief examinations of their hives. Quite a few beekeepers are finding larger than normal numbers of colonies have died as a result of starvation. Bee hive starvation is easily identified by finding a considerable number of dead bees with their bodies located inside the cells, head first as in today’s photo. The queen can be seen in the center. 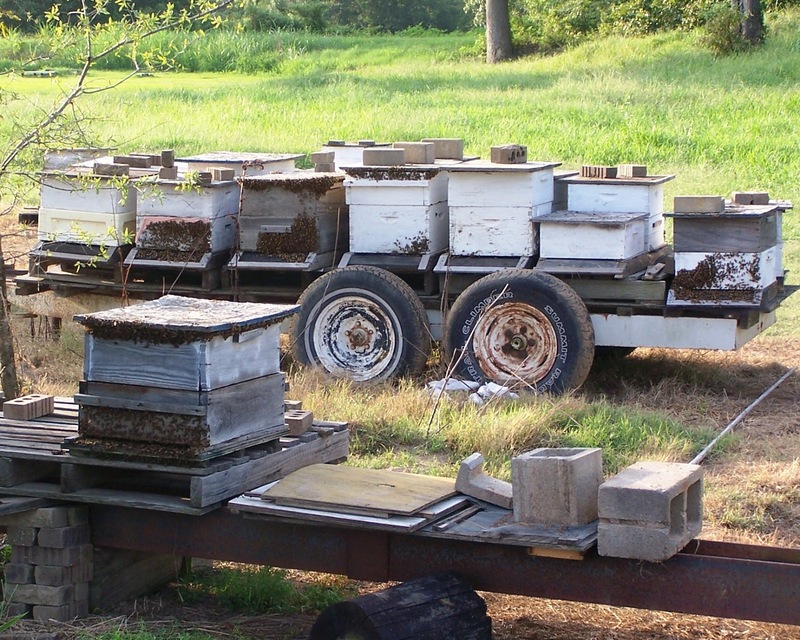 A number of Mid-South beekeepers found similar starvation situations. Each beekeeper distributed the surplus honey from the dead hives to living hives. There is still a considerable amount of winter awaiting the bees before spring flowers supply the bees with food. In the meantime, beekeepers can supply emergency feeding by pouring dry sugar onto the hives’ inner covers.